Chat for Adults with HFA and Aspergers: Asperger's Boyfriend Doesn't Like To Be Touched? Asperger's Boyfriend Doesn't Like To Be Touched? "My new boyfriend advised me he has asperger syndrome, which I have no problem with that (other than I don’t really know a lot about the ‘disorder’). I’m very interested in him …he’s a really nice guy, but I have one issue that puzzles me. He seems to pull back a bit when I make physical contact with him (lean against him, put my arm around him, for example). He says that sometimes it’s hard for him to be touched by others and stated that he never liked to be hugged by anyone as a child. This concerns me, because how can you have a close relationship with someone who is uncomfortable with physical touch… would be really hard to have a man that you can't hug, kiss or hold. Is it common for aspergers?" Although it can happen, it is rare for adults with Asperger’s (high functioning autism) to "refuse" to be touched at all times - in all situations. However, it is fairly common for them to have tactile sensory issues, which may make them avoid certain types of physical contact with others on occasion. BUT... this really has nothing at all to do with the inability - or lack of desire - to show or receive affection. I work with many adults on the spectrum, and they are the most kind and compassionate people I know! So please don't make the mistake of taking your boyfriend's lack of interest in physical contact as a personal insult. One of the most pervasive myths that surrounds Asperger’s is that a person who has it will never show affection and can’t accept receiving affection from others. Asperger’s and the way it affects people really runs the gamut from mild to severe. An excellent point to remember when dealing with a person on the autism spectrum is that each one of them is different and will react to almost everything differently. For a few Asperger’s adults, a simple, random hug can be sensory overload. They can become agitated if they are touched without prior warning. You will probably need to have a trial-and-error approach when it comes to hugging and touching your boyfriend. Some methods may be responded to in a positive way, other ways might not be. You just have to try and see. When you want to give your boyfriend a hug, instead of rushing into his personal space and just taking one, approach him and open your arms. Smile and see how he responds. If he doesn't come running in for a hug, don’t feel snubbed. It just wasn’t the right time. Let’s don’t sugar-coat things here, though. 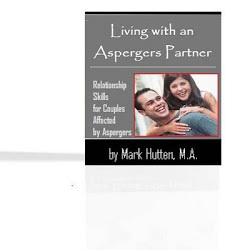 You need to know that trying to figure out a puzzling disorder like Asperger’s can be a lifelong challenge, and for many partners and spouses, the affection issue may be the biggest. But with patience and learning to go by your boyfriend’s cues and not your own, you will be able to connect with him in a deep and satisfying way. • Anonymous said… Been diagnosed at 44 with Asperger's officially this year (2017) I was and sometimes still am, "skittish" about people touching me. this is not just for personal relationships, also friendships, work etc. let him make the first move but let him know you want him to touch you or that you want to touch him. :-) takes some of the stress away. • Anonymous said… I can ID with that poor chap; i think we can see what we miss out on due to our hypersensitivity. • Anonymous said… I sometimes have this issue as well. But it's more I don't want to be touched or held onto by certain people. My close friends or a girlfriend(intimacy is no problem for me)could grab on or hug or lean on me, but I'm uncomfortable with touching or being touched by certain family members or people who are effectively strangers to me. I definitely tense up when grabbed or touched by someone other than those truly close to me. • Anonymous said… I'm the same it took a while before I was comfortable with my boyfriend initiating contact, and even now if I'm out of sorts in any way or upset he know not to try to hug me, but hugging a person is his instinct when they are upset and it took him time to get used to not doing it to me. He does say that because I don't like contact that much, it makes it mean so much more to him when I do show affection and give him a hug or kiss. • Anonymous said… It can be VERY difficult if that's a true need for you. • Anonymous said… It's absolutely fantastic he told you up front!! Just know his love for you will be shown in different ways. You'll both have to make adjustments.... but isn't that true of any relationship? I've been with my asperger's husband for 10 years now. • Anonymous said… No, no we don't. It takes a very long time before I feel comfortable with someone even high fiving me. • Anonymous said… This is a common thing sign aspergics. I used to 'ball up' when ever some one Hugged me. • Anonymous said… You might find it a bit ridiculous, but my husband sometimes ask before, like "hey can I hug you now and I find it much more easy because I know what's coming, and I'm really enjoying it. It’s Asperger’s! Should You Share the News?